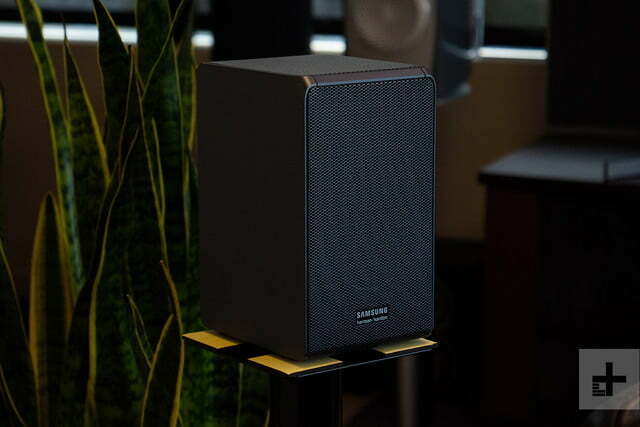 By far the easiest way to land spectacular Dolby Atmos surround sound. 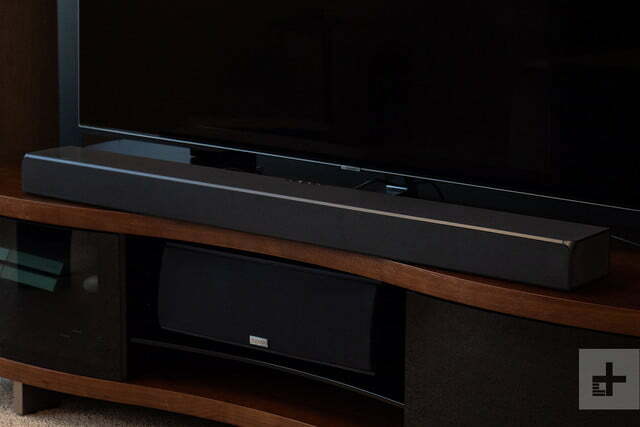 As the first soundbar to come out of Samsung’s Californian audio lab, the HW-K950 Dolby Atmos soundbar was a real gamble. In fact, with its dual wireless surround speakers, 15 drivers (including four fired at the ceiling), and a $1,500 price tag, the K950 might be better described as an all-in, pink-slips-on-the-table bet on Atmos. Luckily for Samsung, going big paid off. 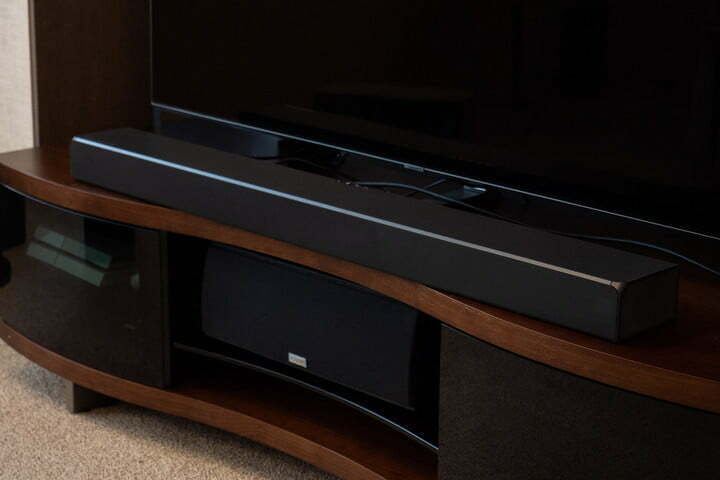 The K950 was a success, helping to usher in a new era of powerful and convenient Dolby Atmos soundbars. The follow-up to the K950, the HW-N950 is even more formidable than its predecessor — and at $1,700, it’s got the price tag to prove it. 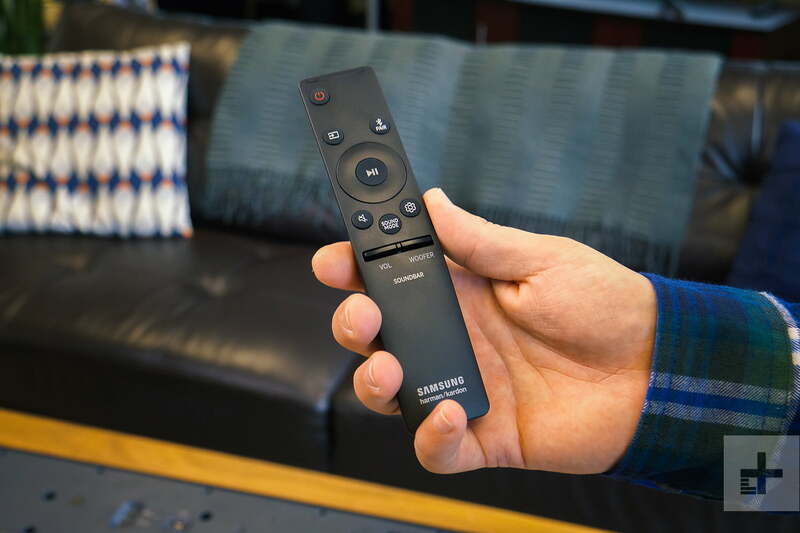 Boasting new side-firing front drivers for a wider soundstage, support for both Dolby Atmos and DTS:X 3D surround, and impressive clarity across the board, Samsung’s latest audio powerhouse has again laid down the track for other surround soundbars to follow. 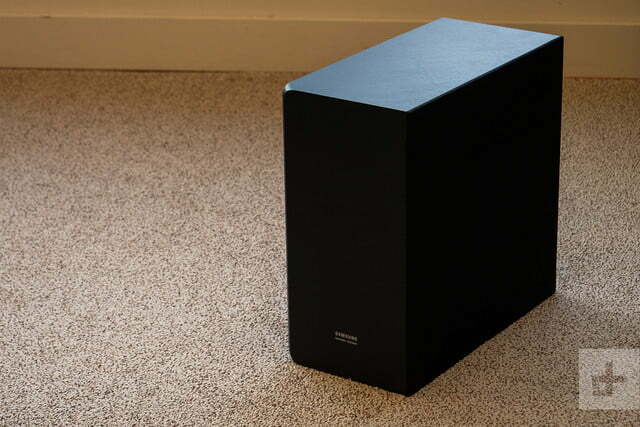 It’s not easy fitting 17 speakers into a soundbar system, and that’s readily apparent from the N950’s box: A massive rectangle of white and beige weighing 60 pounds total, the package is a beast to bring home. 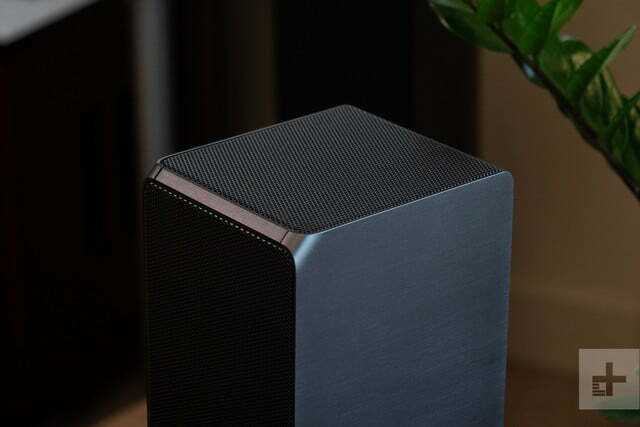 Inside, you’ll find all the components packed in foam, including the soundbar itself (all 20 pounds of it), a tall drink of a subwoofer, and miniature satellite speakers, all of which are finished in glittery black plastic matched by long strips of mesh grill. The N950 is only slightly bigger than its predecessor, and just as plain-Jane in design, with the side-firing drivers at the end caps and a new central location for the onboard controls panel presenting the only notable changes visually. A UPS-tan box of accessories holds all you’ll need for setup, including power cables for all four components (wireless or not, the speakers won’t power themselves), an HDMI cable, a manual, and a mounting kit. At nearly 4 inches deep and over 48-inches across, the N950 takes up a lot of TV console real estate, but if you plan on mounting it, you’ll want to make sure you hit studs behind the drywall. The Samsung HW-N950 offers brilliantly simple operation. The N950 boasts two HDMI inputs for plugging in components like Blu-ray players or streaming boxes (it would have been nice to get a third), and we recommend plugging in your top sources directly for best results. Additional connection options include a digital Optical input, Bluetooth, and Wi-Fi. The wireless satellites and subwoofer pair automatically to the soundbar, but we recommend you follow the order set out in the manual when plugging the system in (subwoofer first, then satellites, then soundbar) or you may get the dreaded red or flashing-blue LEDs on the back of the speakers and be forced to restart. 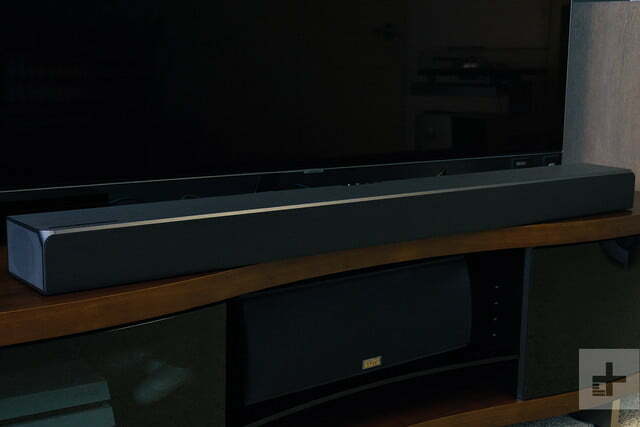 Unlike Yamaha’s Atmos/DTS:X YSP-5600 soundbar, there’s no auto calibration here, so you must adjust each channel manually for balance. If possible, Samsung recommends placing the surrounds and soundbar equidistant from the listening position for best results. Even after a week on our TV console, we were still getting used to just how massive the N950 is. 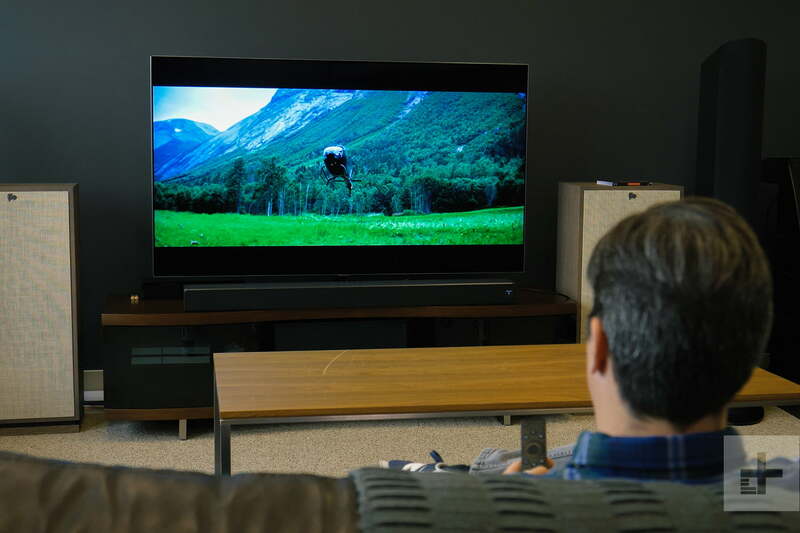 It helps to have an equally massive TV — 65-inches or bigger takes away some of the focus — but it’s still hard to miss. 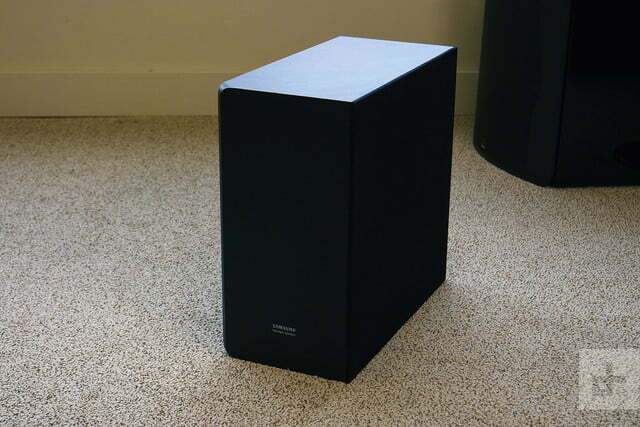 And even though it’s a lot smaller than a traditional Dolby Atmos speaker setup, be ready to invest space as well as cash. The N950 boasts dual woofers and a single tweeter for each of its three front channels. 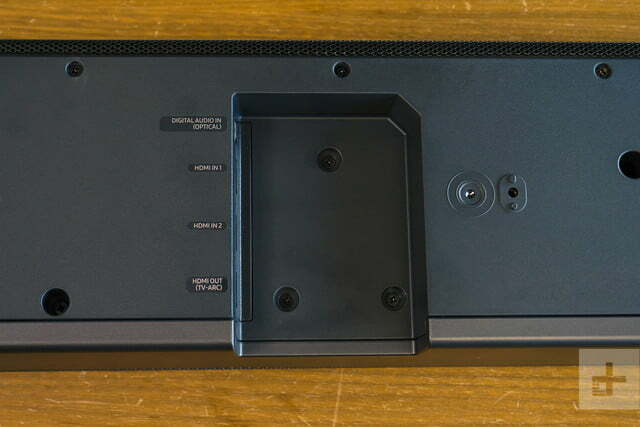 Those are matched by dual up-firing drivers on the top of the bar, as well as one each atop the satellite speakers to bounce sound off the ceiling for 3D surround sound immersion. New are the aforementioned side-firing drivers, which are designed to bounce sound off your wall for side surrounds, creating a 7.1.4 surround setup that outpaces the K950’s 5.1.4 setup. 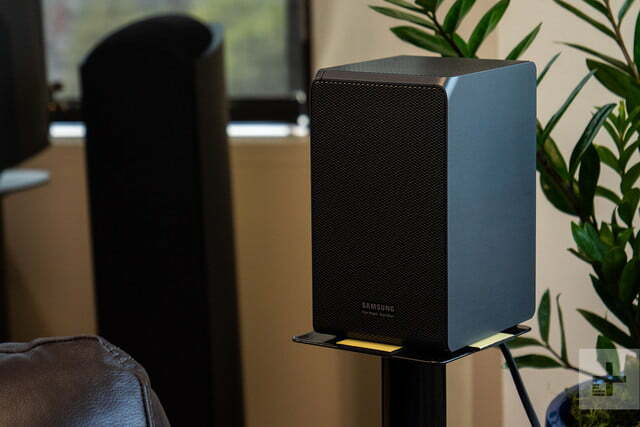 While we can’t say the side-firing drivers equate to the same kind of immersion and detail you get from actual side-mounted speakers, they do enhance 3D-surround performance for a broader, more fluid soundstage. Power, fluidity, and sheer clarity in detail were all at the forefront. 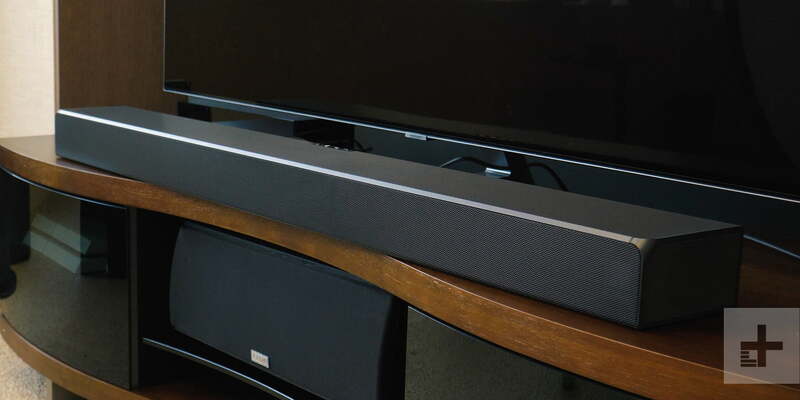 Minimalism is a theme among all of Samsung’s latest soundbars — from aesthetics to operation — and the N950 follows suit for brilliantly simple operation. Those familiar with the Sound+ bars (and Samsung TVs for that matter) will immediately recognize the N950’s sleek, cradle-stick remote. Tactile keys for volume and subwoofer levels make it easy to make adjustments in the dark, while hitting the Sound Mode key calls up the “Smart” sound mode. Smart mode is designed to adjust the system for whatever source you’re playing back — i.e., set it and forget it. Standard and Surround modes are also available, but the Smart mode generally works best for us. That’s a welcome change for those who don’t want to futz with multiple DSP modes or a convoluted on-screen menu, but it is limiting when it comes to tuning the system to your room — especially since there’s no auto-calibration. It’s still pretty simple to adjust individual channels using the Settings and Navigation keys, with the LED display at the bar’s right side as your guide. One gripe is the limitation of just Treble and Bass settings for EQ — we’d love to see a Midrange option added there — but holding down the Settings key for 5 seconds allows multiband EQ adjustment, so it’s more inconvenience than hindrance. One of the N950’s most notable additions over the K950 is decoding for DTS’ audio suite, including lossless audio for DTS HD. While most 4K Ultra HD Blu-ray discs these days opt for Dolby Atmos over DTS:X, plenty of legacy discs and other formats support DTS surround, and that’s key, as the N950’s performance improves immensely when fed less-compressed signals. Soundbars are soundbars, and you’ll never be able to land the detail and ferocity of a fully discrete surround sound speaker setup. Still, the N950 comes as close as we’ve ever heard. We found ourselves remarking aloud at how sweet and smooth instruments sounded. 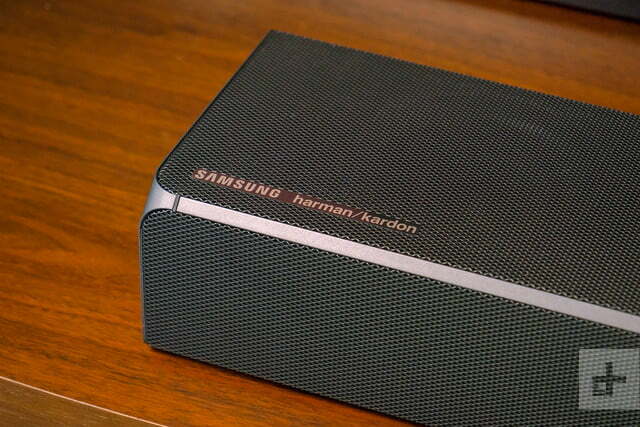 We can’t say for sure if Harman Kardon participated in tuning the N950’s drivers — the recently acquired brand’s name is prominent on both the bar and the remote — but we can tell you that this is the best-sounding bar we’ve tested from Samsung yet. 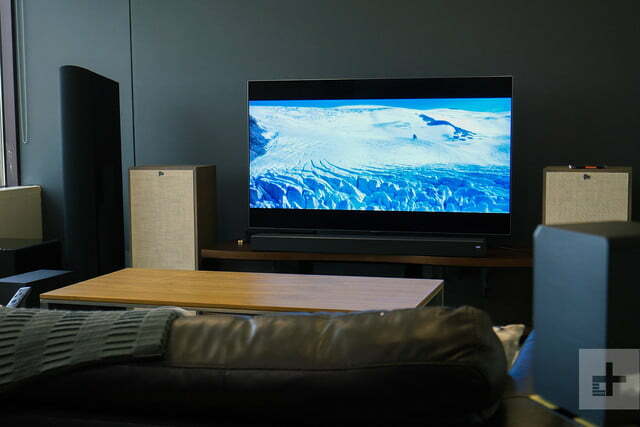 Investment in audio is paying off for the company best known for its TVs and phones, and it’s nice to see — or hear — concrete results. 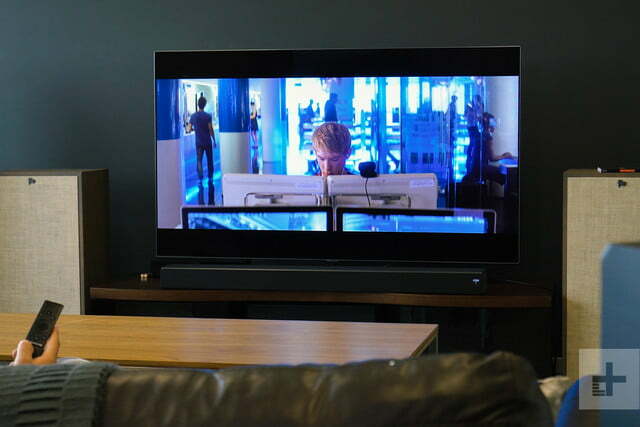 From the moment we plugged in our Dolby Atmos test disc, we knew the N950 was special. Power, fluidity, and sheer clarity in detail were all at the forefront when diving through the specially crafted scenes. In fact, after the first test scene, Amaze, which offers a litany of overhead movement (the main selling point of 3D surround systems), trickling effects from the sides and behind, and powerful bass, our first note was simply: DAMN. The circular movement of the bird in the scene was expertly tracked as the bar and speakers pushed the sound around our rectangular living room. The rain overhead was clearly defined and streamed down in tactile drops, while the potent bass flex was lovely, smooth, and powerful without being overbearing or tubby. Another impressive test came from the Crash scene, which is literally just a slow-motion shot of a baseball going through a window. We’ve heard the scene multiple times, but even when compared to similarly priced discrete systems like Focal’s Sib Evo Dolby Atmos satellite setup, the N950 loomed large, offering more power, better clarity, and fine-tuned detail of each and every shard of broken glass floating overhead. Moving on to films, we were continuously impressed with the N950’s handling of more intimate moments, as well. Oscar Isaac’s dialogue in Alex Garland’s masterpiece Ex Machina was almost entrancing as the character gets progressively drunk on vodka, and we found ourselves rapt by his Promethean rambling. Turning to lesser-produced content brings the bar down a few notches, and stereo content can even get just a touch shouty at times, while bass can occasionally fall out of balance. Still, once you’ve got it tuned to your room, TV content offers smooth midrange performance matched by clear, detailed treble. The N950 does a pretty fine job with your music, too. 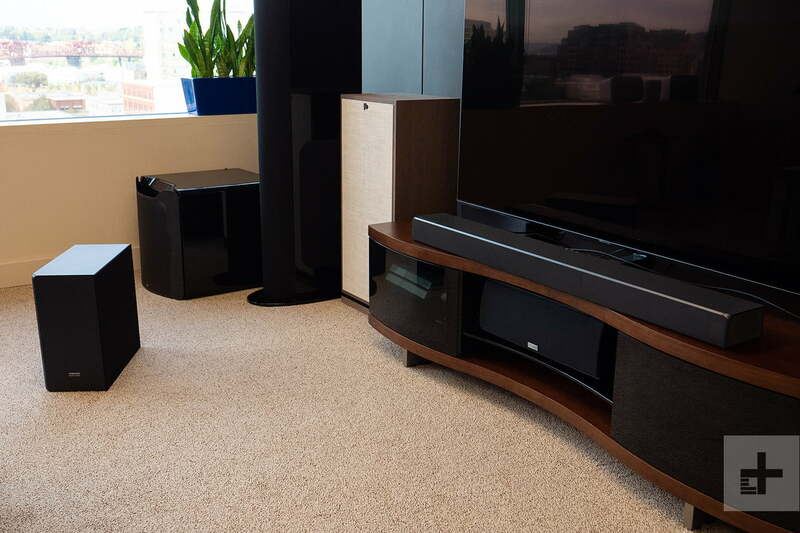 Performance isn’t nearly as eloquent, natural, or beautiful as, say, our KEF LS50 Wireless speakers — which top out at a few hundred dollars more — but you’re bound to make some serious compromises with a soundbar, especially one designed for cinematic playback first. What’s more, we found ourselves remarking aloud at how sweet and smooth instruments sounded at times, especially brass and strings. The HW-N950 has a 12-month warranty against manufacturer defects once registered. You can find out more about the warranty at Samsung’s website. 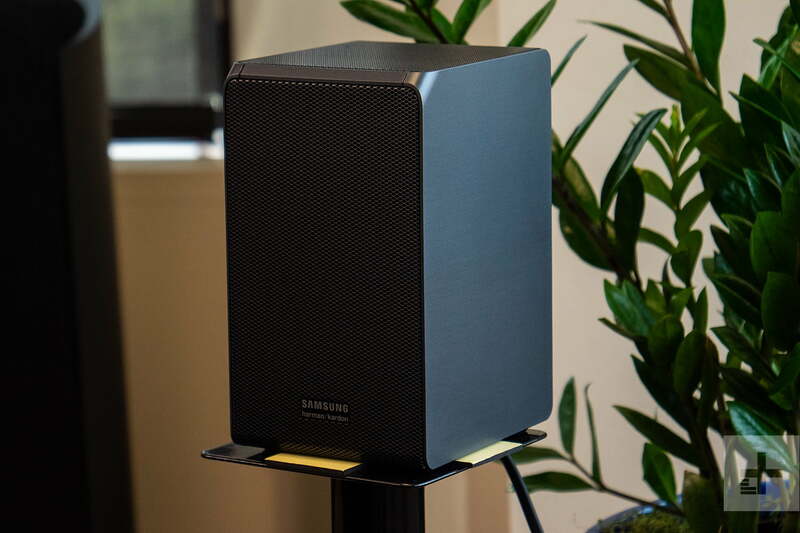 Simply put, Samsung’s new HW-N950 presents the easiest, must unobtrusive way we know of to land spectacular Dolby Atmos (and DTS:X) surround sound for your home theater. 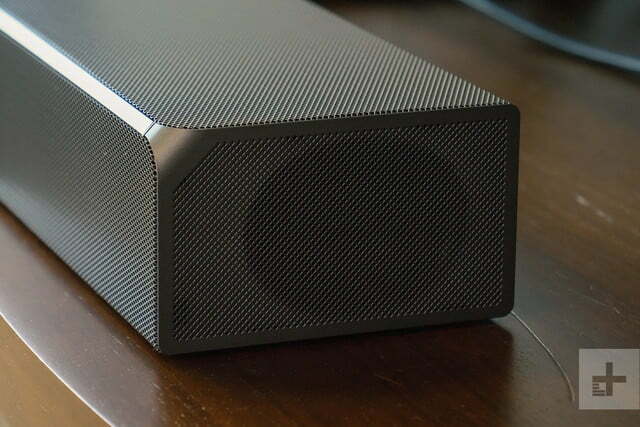 It’s among the best soundbars of 2019. While Samsung’s aging HW-K950 is a viable alternative, it’s Vizio’s SB46514-F6 that is the best alternative if you’re looking to save some cash. 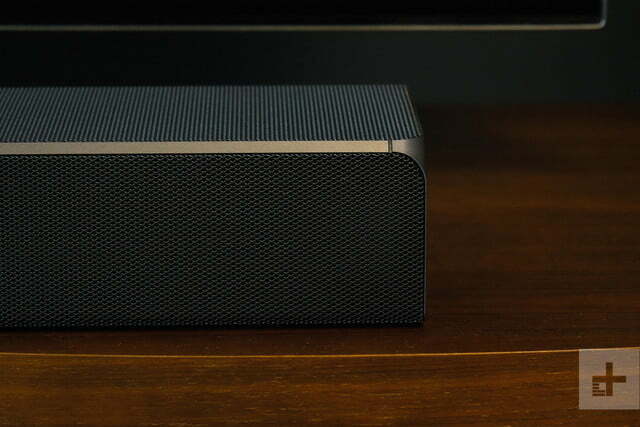 While the interface is a little clunky, Vizio’s bar puts out powerful and immersive 3D-surround and booming bass thanks to a 10-inch subwoofer companion. While it sheds some of the frills, at around $1,000 or less, it’s a serious value proposition and much more in line with most budgets. The HW-N950 appears to be quite well-built, and with 4K Ultra HD and HDR passthrough at 60 fps alongside both Dolby Atmos and DTS decoding, it should remain relevant for years to come. Yes. 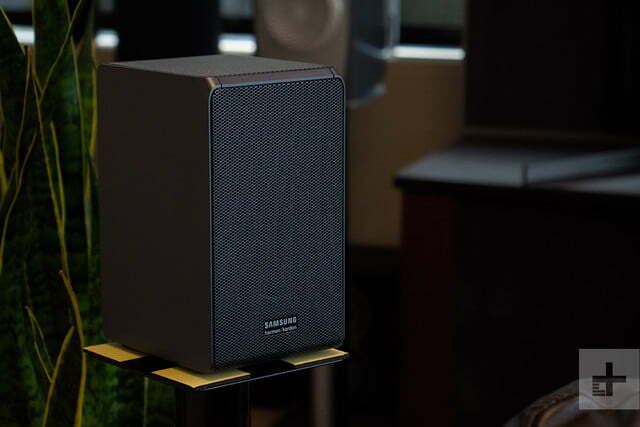 If you’re seeking the full-bore thrills of Dolby Atmos and DTS:X surround sound in the convenience of a singular system (and you’ve got the money), Samsung’s HW-N950 is the bar to beat. 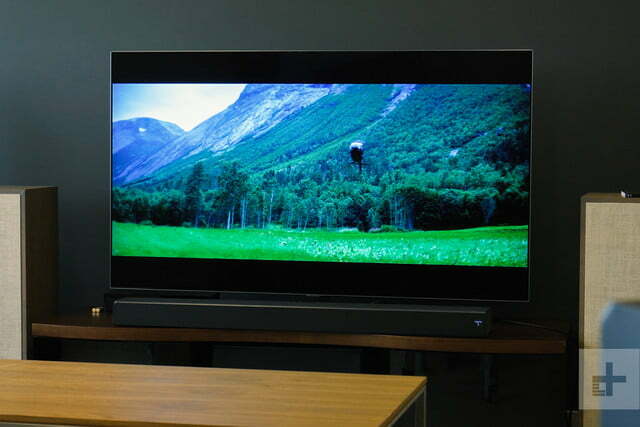 Updated 3-1-2019: Updated copy to make current and added Vizio’s 46-inch 5.1.4 soundbar as a new, much more affordable alternative.